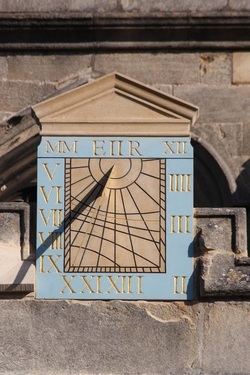 Stamford Civic Society's sundial project was actually a combination of two projects, one partially funded by the Harry Skells Trust, and the other by the Heritage Lottery Fund. The press release “Stamford Civic Society wins Heritage Lottery Fund” that announced the projects was released on October 12th 2012. A photographic archive covering the old sundial conservation and the making of the new one has been created. Local schools and colleges took part in the project; the Civic Society held an exhibition and a number of lectures on sundials and conservation as part of it. After many weeks of planning, the original sundial, dating from the early 18th Century was safely taken down for conservation on January 9th, 2013. Detailed measurements of its exact position were taken by Ms Harriet James of Sunnydials. Harriet acted as consultant to the project. The original plan was to do the measurement on the 9th, but a lack of sun forced us to wait 24 hours. Based on Harriet’s measurements, a new sundial was carved, painted and erected at All Saints’. At the end of February, the conserved sundial was returned to its new resting place, inside All Saints’ Church, by the North door. The iron pins used to secure the pediment to the dial and the dial to the parapet had rusted and expanded, forcibly splitting the stone and leading to its failure. In addition, the iron fixings used to secure the gnomon to the face of the dial caused a longitudinal crack extending the full length of the dial. Inappropriate cement mortars were then used to repair this damage – probably on two separate occasions in the late nineteenth century – these mortars exacerbated the damage further. It is impossible to say whether the original sundial was coloured, although this is likely, given its approximate date of 1720. The decision was made that the new sundial should be coloured blue, to make it a visible feature looking on to Red Lion Square. In common with sundials of this period, the numbers would be gilded. To commemorate the Queen's jubilee in 2012, E II R and the date MMXII are in gold at the top of the dial. The declination curves on the dial include one for the Queen's accession date of February 6th, and one for the formation date of the Stamford Civic Society - October 13th. The new sundial was manufactured in Cliveden's Warminster workshop and then moved to Norfolk to be painted and gilded. On April 16th, work started to install the new sundial; we needed sunshine for the final measurements to be made, and the work was completed two days later. In addition to installing the sundial, part of the adjacent wall was replaced, as it was in poor condition. The Bishop of Lincoln conducted a brief ceremony at the Church on June 25th, attended by members of the project team and representatives from the Skells Trust, Stamford School, St. Gilbert's School and New College. After the ceremony, a reception was held in St. John's Church, where an exhibition of work by members of Year 9 at Stamford School together with Civic Society photographs and QR code work was on display. Two Information Boards were installed on June 24th; one in the Churchyard below the new sundial, explaining how to tell the time using a sundial, and the other inside the Church adjacent to the conserved sundial, explaining its history and conservation. 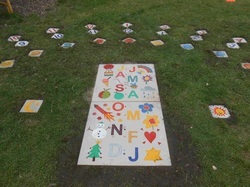 A playground sundial provided by Harriet James of Sunnydials was installed at the school in mid-June. As part of the day, Harriet helped members of Year 5 make their own sundials. Unfortunately the sun did not cooperate, so the class was not able to try out the sundial, which uses the person standing on the centre stone as the gnomon; his or her shadow then points to the time, indicated on stones set into the ground. The stones have been carved with designs provided by members of the class. It was hoped that a project to provide QR codes linked to a Stamford Heritage website could be incorporated into the Sundial Project as part of its heritage element. Unfortunately, although there were some people who were very enthusiastic about it, there were not enough volunteers to make it viable. The contents of the website has been transferred to the Civic Society website, under Stamford Heritage, so the work has not been lost. It may be possible to resurrect this project in the future, when technology improves. Stamford Civic Society working in collaboration with local primary schools has created a Children's Town Trail which aims to be a resource for primary schools to use as part of their local studies. The unique aspect of this Trail is that it has been produced for children by the town’s children. Stamford primary school children of all ages have chosen, researched, illustrated and written about their 15 favourite places in Stamford. Text, artwork and the initial designs have all been produced by the children from Malcolm Sargent's school, with other contributions from local artist Karen Neale and graphic designer Paul Eastwood, and children from St.Gilbert’s Primary School who designed the Trail’s logo. We are grateful to the Stamford Kiwanis who have also provided funding to the project. The trail was launched at a ceremony in the Town Hall; attendees included the Mayor, the children whose designs were used in the leaflet and their parents. Copies are available from the Tourist Information Centre, the Library, and many other places in Stamford. You can see the trail here. If you want to download and print your own copy, we have instructions on how to do it here, and the files you will need here and here. A talk was given to students at New College on the history of sundials and the class also made their own sundials. A media project by New College students has resulted in a film describing the project. We hope the results will be shown at the Arts Centre. A visit to Clipsham Quarry and the workshop of Weldon Stone to view stone in its natural environment, was made by students from Queen Eleanor and New College. Dr Frank King, Chairman of the British Sundial Society, spoke at the Arts Centre, covering the mathematics behind sundials. A sundial committee member has presented a talk to a number of organisations in the town, entitled “Looking at our Heritage – the top five local sundials”. A conservation specialist discussed the chemical and physical attacks on our buildings, and the conservation of stone. We hope to publish this talk as a paper. As part of Heritage Weekend 2013, we arranged visits to local churches, a guided walk round Stamford and a Collyweston slate demonstration, that owing to demand was repeated in June 2014. In conjunction with Stamford library, we have brought up to date and have re-published the Stone Trail guide which has been out of print for some time. The trail is available from Stamford Library, costing £1.